Presentation speech template including eleven speech topics for presenting an award, prize or gift to a happy recipient leading to a brief photo opportunity in the end. Bear in mind that you have to be short and sweet epitomizing. Each of the public speaking speech topics take two or three sentences maximally. The layout in this tutorial helps an enchanted public speaker to set up a good and aesthetically ceremonial award presentation. The first remark you have to make is a commenting to the occasion. Refer why you are here together, refresh their memories a bit by stipulating why this is such a special day. Enforce the power of the delightful purpose of this meeting, and the happy recipient. Symbol E.g. ? ? The award exemplifies the visionary dreams and widespread aspirations of the Jack Jackson Foundation. Goal E.g. ? Focuses on stimulating excellence in fitness facilities of the gym clubs in Anywhere Village. Categories E.g. ? Classroom awards for students, prizes for teaching perfection, medals to commemorate outstanding innovation implementation in pedagogics. History E.g.? Are given out since 2008 to honor scientists who made outstanding contributions to research and education of multimedia authoring tools for interactive games. Named after E.g.? ? It is named after the Right Honourable Pete Peterson, the former chairman of the school board Ed Ucator, who demonstrated an exceptional commitment to cutting overhead college costs that resulted in more money for practicum lessons. Previous winners E.g. ? A roll call of past winners, including the nominations, who are praised for their extraordinary efforts. Describe the organization you are representing. Tell why you are privileged to present. 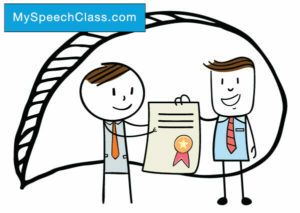 Make your speech personal, offer personal thoughts, experiences and feelings. Praise the recipient. Present outstanding contributions, achievements or records that are relevant. Adapt them to the goals and meaning of the ceremonial special occasion. Explain why the contributions are outstanding or unique. What offers did it take the winner? Refer to special qualifications and to similarities with other recipients. Again: keep it short – 3 minutes for your award speech will do most of the time. Although it even can be somewhat shorter. Mention the reasons for choosing her or him as recipient. Link the contributions to the meaning of the honor. Make a concluding characterization by telling a compelling story or anecdote in the presentation speech text. Ask if the receiver will come forward and declare her or him the winner. Link the previous speech topics to what the prize gift stands for. Tip: read the inscription out loud and show the golden medal, the engraved plaque, the recognition trophy cup, or the certificate words. At the end of your address congratulate her or him. Hand over the award, prize, diploma, certificate or gift card. Shake hands with the person or group being honored. Schedule a brief photo opportunity and smile to the camera! After the ceremony you could allow a small interview to invited journalists. Finally, of course give the winner the opportunity to speak after your award presentation speech adress. And start clapping your hands to express your honest approval after she or he has completed the thank you phrases. Keep smiling all the time. Cite this article as: Jim Peterson, "Award Presentation Speech," in My Speech Class, May 14, 2018, http://www.myspeechclass.com/award-presentation-speech.html.